We’d love your help. 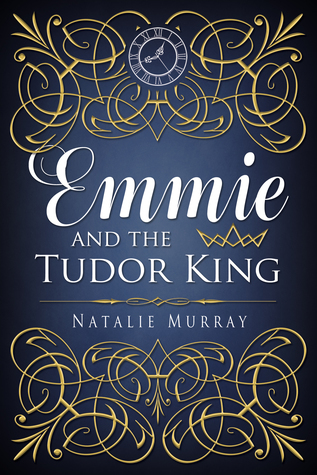 Let us know what’s wrong with this preview of Emmie and the Tudor King by Natalie Murray. One moment, Emmie is writing her high school history paper; the next, she's sitting with a gorgeous 16th century king who vacillates from kissing her to ordering her execution. Able to travel back to her own time, but intensely drawn to King Nick and the mysterious death of his sister, Emmie finds herself solving the murder of a young princess and unraveling court secrets w One moment, Emmie is writing her high school history paper; the next, she's sitting with a gorgeous 16th century king who vacillates from kissing her to ordering her execution. Able to travel back to her own time, but intensely drawn to King Nick and the mysterious death of his sister, Emmie finds herself solving the murder of a young princess and unraveling court secrets while trying to keep her head on her shoulders, literally. To ask other readers questions about Emmie and the Tudor King, please sign up. I had the opportunity to read some early works by Natalie a few years ago and was always drawn to her style of writing "Fan fiction". So I was immediately interested when I heard she was writing a new novel. I had the opportunity to get a hold of a review copy of "Emmie and the Tudor King" and quickly dove right in. I will admit that I was unsure if I would enjoy the Tudor's as their time was never an interest to me. My fears were quickly erased as I was thrust into the time of King Nick and a world I suddenly found fascinating due to the descriptive storytelling that Natalie presented. But while Nick is a smoldering and fascinating leading man, Emmie holds her own as an adorable but stubborn and independent girl who kept my interest tuned in and me turning page after page to find out what was going to happen with her and the Tudor King. For two days I was rushing home from work to read more pages and get drawn even further into their intriguing story. This was such a fun book. Emmie and Nick were adorable together, obviously, but it was the plot itself that really shined. There was a bit of Connecticut Yankee in King Arthur's Court mixed with swoony romance and it was a delight to read. I was kept guessing and just couldn't put it down. I adored the way Emmie's life in the past paralleled her modern life and the way she forged relationships, and it was all really well done. I'm so happy I got to read it. I loved King Nick. He’s the perfect king in this alternate history of the Tudor line. And Emmie and Nick make me sigh every time they’re together. Natalie Murray has been writing to make people smile ever since her short story 'A Dog Story with a Happy Ending' won first prize in a writing competition when she was eight (she didn’t quite understand titles and spoilers then!). Now slightly *cough* older, Natalie is irreversibly committed to writing novels she loves to read: anything involving high-stakes adventure, touches of history or fantas Natalie Murray has been writing to make people smile ever since her short story 'A Dog Story with a Happy Ending' won first prize in a writing competition when she was eight (she didn’t quite understand titles and spoilers then!). Now slightly *cough* older, Natalie is irreversibly committed to writing novels she loves to read: anything involving high-stakes adventure, touches of history or fantasy, and star-crossed lovers with buckets of exquisite angst. After completing a Bachelor of Arts with a major in Communications at Australia’s Griffith University, Natalie landed the role of entertainment reporter for Sky News Australia and New Zealand, interviewing such high-profile personalities as Elton John, Angelina Jolie, Sylvester Stallone, Dustin Hoffman, Cameron Diaz, Matt Damon and Jerry Seinfeld. She’s also worked as a corporate copywriter, Bollywood movie dancer, and dementia care worker, but Natalie knows what she loves doing most of all: looking after her family and writing YA romance fiction.